This thread demonstrates the use of the set_full_model functionality for manually defining a complete source model expression for fitting spatial 2-D data, where one or more components are convolved by a PSF model, and others are not. An exposure map file is input to Sherpa as a file-based exposure map model via the load_table_model function, and used in the fitting of all model components, both unconvolved extended emission and convolved point-source emission. A Point-Spread-Function (PSF) image is loaded via load_psf to be used as the convolution kernel for the point-source emission, only. Last Update: 10 Dec 2015 - reviewed for CIAO 4.8, no content change. Please follow the Sherpa Getting Started thread. In this thread we use 2D spatial data from the FITS data file src_image.fits, which was created by binning a Chandra events table in sky coordinates and filtering it to contain only the source region of interest—a square region of extended source emission containing a bright central point source. This data set is input to Sherpa with the load_image command, and can be visualized with the image_data or contour_data commands. 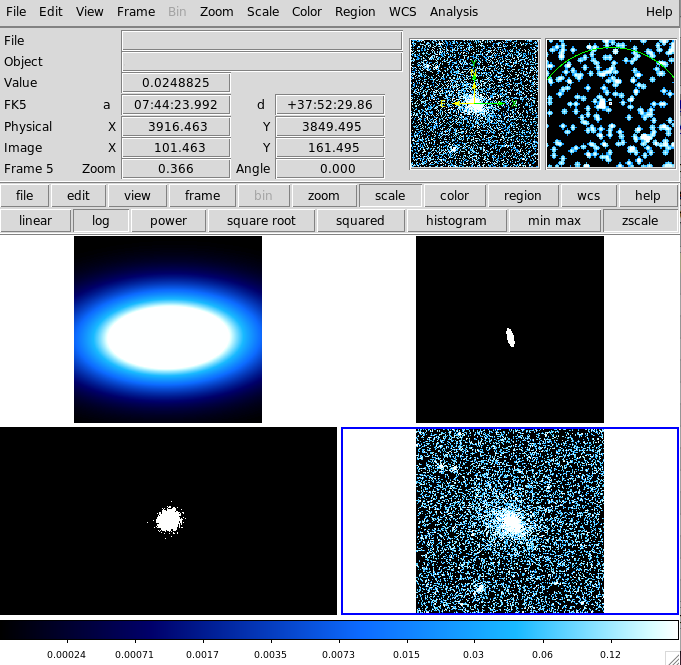 The image_data command opens the source data image in DS9, as shown in Figure 1, where in this example, each pixel subtends 0.492 arcseconds (a sky coordinate binning factor of 1 was used). Image of source data sent to DS9 by the Sherpa image_data function. The image has been smoothed in DS9 using a 2σ Gaussian. The show_data command lists information available for this data set, such as the binning of the image, physical dimensions, and coordinate system. In order to define a multi-component source model expression in Sherpa containing both convolved and unconvolved components with which to fit a single data set, the model must be manually defined using the set_full_model function (as opposed to the set_source function, which automatically convolves an entire source model expression with a PSF or response model). After examining Figure 1, it is apparent that a 2D Beta model is appropriate for describing the extended component of the source emission, while a PSF-convolved 2D Gaussian model can be used to describe the central point-source component. We choose to apply an (optional) exposure map model to the full source model expression to account for a variable response across the data image, and convolve only the point-source model component by a PSF model. First, we set up the exposure map and PSF model components, and then define the full source model expression with set_full_model. A PSF instrument model may be established by loading an image of a PSF into Sherpa, e.g. one created with the Chandra Ray Tracer (ChaRT), or by defining a Sherpa model expression which describes the shape of the PSF. Both types of PSF models are added to the current list of models in the session using the load_psf command. 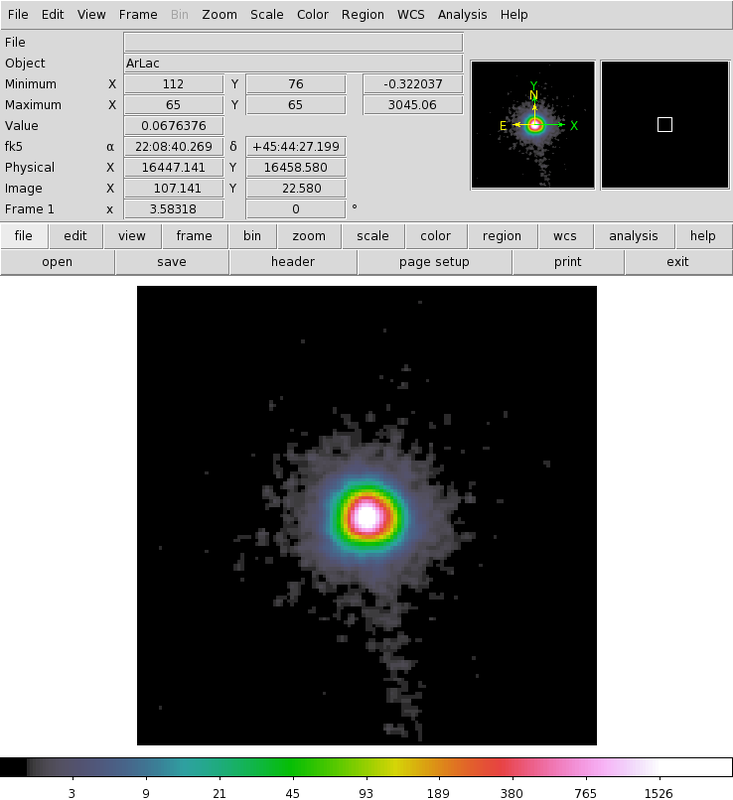 In this example, we load an image containing the Chandra PSF at 1 keV, at the position of our point source on the ACIS-S3 chip. Normally—i.e., when set_source is used to define a source model expression—the model to be used as the PSF convolution model must be defined as such with the set_psf command; however, it is not necessary in this case since we are manually defining the full source model expression using the set_full_model functionality, as shown in the next section of this thread. To learn how to fully establish a PSF model when defining a source model with set_source, see the Sherpa thread Accounting for PSF Effects in 2D Image Fitting. The PSF image is shown in Figure 2. In a set_full_model expression, any response or PSF convolution models which should be applied to one or more individual model components must be explicitly defined—in this example, the PSF convolution model named "psf0" is applied only to the 2D Gaussian model component used to describe the point-source emission. These commands create the images displayed in Figure 3. DS9 display of images of the individual, fitted model components contributing to the full model description of the extended and point-source emission (some images have different scale and zoom settings for visual enhancement). In the upper-left corner of the display is the 2D Beta model component fitted to the extended source emission; in the upper-right is the unconvolved 2D Gaussian component used to describe the central point source emission; in the lower-left is the PSF-convolved 2D Gaussian component; and in the lower-right is the smoothed data image for comparison. There are several things to note about the series of commands issued above for creating the display in Figure 3. First is that, normally, the image_model_component command is used to plot convolved model components, where the PSF or response model associated with a given model component is automatically applied. Since we have defined our source model manually with set_full_model, we must also ensure that we manually convolve source model components within the image_source_model expression, as shown above for the PSF-convolved point-source component of the model. 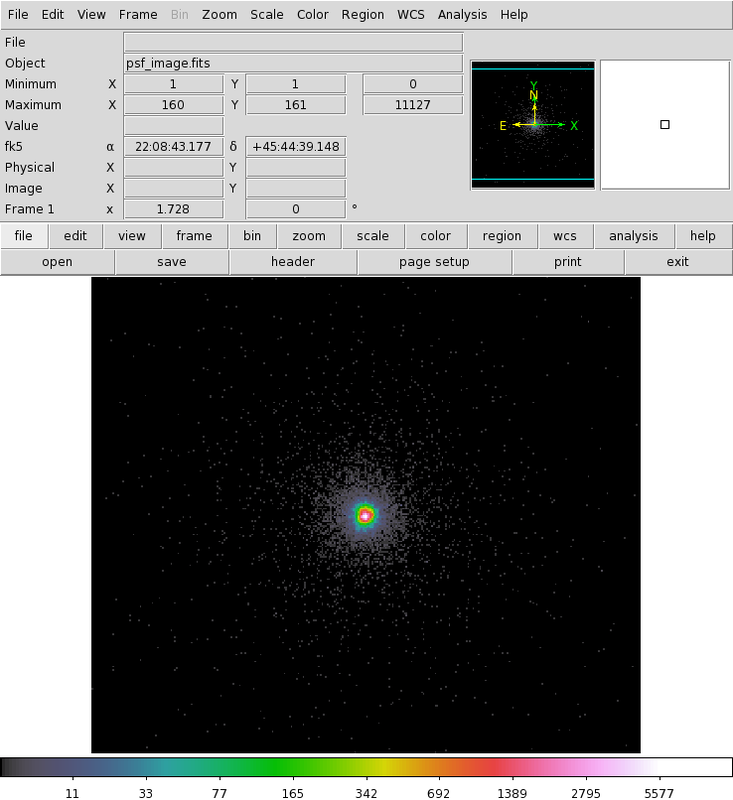 Second, before running the image_source_component commands, the (fitted) (x,y) center position of the individual source model components in physical coordinates had to be adjusted to coincide with the center of the data image in image coordinates, for proper display in the DS9 frame—so approximately (4072, 3945) → (257,253). The save function records all the information about the current session to the binary file manual_fit.save, and the save_all function records the session settings to an editable ASCII file. The file fit.py is a Python script which performs the primary commands used above; it can be executed by typing execfile("fit.py") on the Sherpa command line. The CXC is committed to helping Sherpa users transition to new syntax as smoothly as possible. If you have existing Sherpa scripts or save files, submit them to us via the CXC Helpdesk and we will provide the CIAO/Sherpa 4.8 syntax to you. 07 Apr 2015 reviewed for CIAO 4.7, no content change. 10 Dec 2015 reviewed for CIAO 4.8, no content change.